Disclosure: This post contains affiliate links which means I make a small commission if you use them to make a purchase. If you are still looking for a sweet treat for your upcoming patriotic celebrations, I’ve got an easy recipe for you. 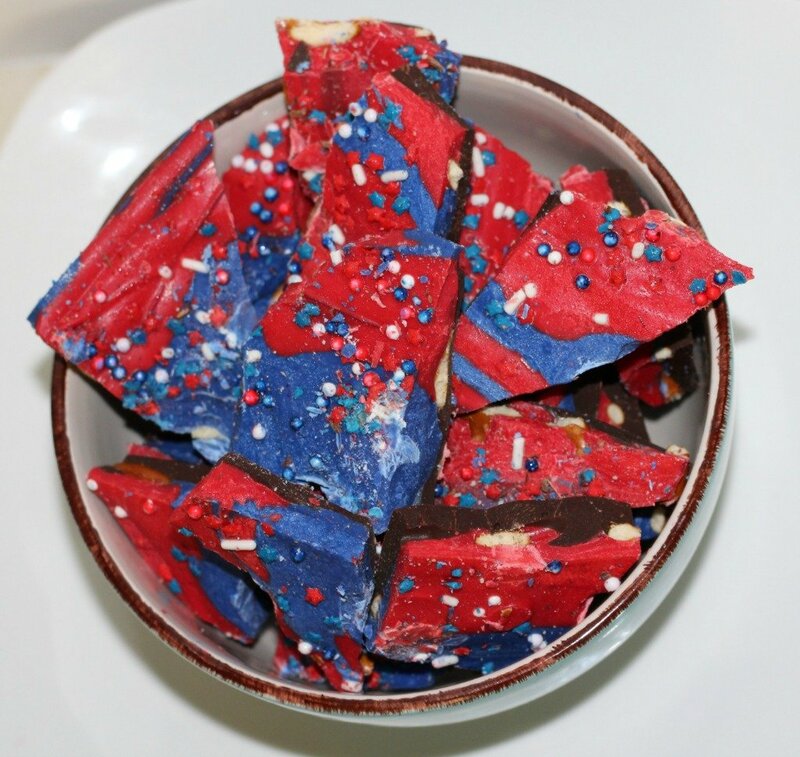 This festive and patriotic chocolate pretzel bark looks and tastes great! For this chocolate pretzel bark, I bought a bag of pretzels (you won’t use the entire bag), 2 bags of Wilton Royal Blue Candy Melts and 2 bags of Wilton Red Candy Melts. I already had white chocolate at home, but guess what…it wouldn’t melt! I got it at our local discount store, so that might explain it. We ended up using 2 bags of chocolate chips instead. It’s still festive and still yummy. But I suggest you buy Wilton White Candy Melts if you want your candy melts to actually melt. In order to make this pretzel bark, line a baking sheet with parchment paper, microwave your chocolates in separate bowls (obviously) for 30 second intervals. Stir. Keep microwaving until the chocolates are melted. Spread the white (or milk in our case) chocolate on the parchment paper. Place a layer of pretzels on the melted chocolate. Then you just spread the blue and red chocolate on in rows until it looks like you want it to look. Sprinkle some red, white and blue sprinkles on top and freeze until set. When the chocolate has hardened, take it out of the freezer and break it up into chunks. It is delicious and easy! You’ll impress your family with your amazing talent, and they’ll beg you to make this for every get-together you have…. Okay, I guess you’re going to have to decide if you want to make this for every get-together or not before you take it places. Doesn’t that look good? Have you ever made pretzel bark? What is your favorite recipe for it? I know I’ve seen ones that are much more elaborate than this, but if you’re going to have to make this for every get-together you’ll ever attend, you might wanna keep it simple. That IS very festive. We have a big cookout on July 4th and I know this would be a huge hit with my guests. Yes! Just keep an eye on the kids…they were going away with huge bowls of it and the parents had to intercept them lol. I love serving red, white and blue foods on Patriotic days like today. This would be a great addition to a Memorial Day cookout or a 4th of July party. It was a HUGE hit at one of our picnics yesterday. It’s a good thing I didn’t take all of it lol. I was trying to think of a great dessert to make for Memorial Day. This looks like it would be perfect. It has that sweet and salty flavor which is what I always crave. Chocolate and pretzels are the best! 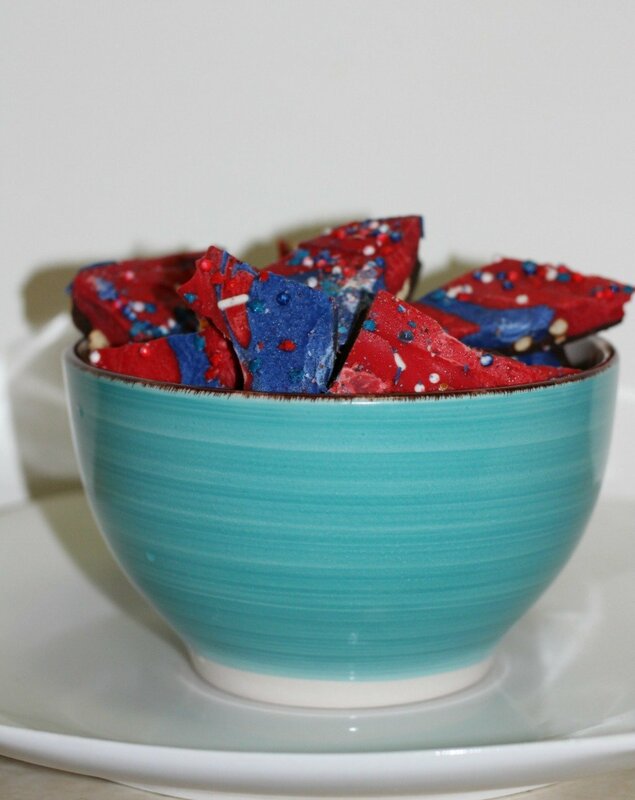 That Festive and Patriotic Pretzel Bark sure does look yummy! I love making peppermint bark around the holidays and white chocolate peep bark around Easter time. Those sound really good too! This is so delicious, In India we do not celebrate this day, but it had made my day by finding this amazing recipe. I would love to try this and have some delicious sweets. I love bark recipes! This recipe looks entirely festive and I love that pretzels are included, too. This is so cute and looks delicious! I might just have to try making a red and white version for Canada day! I should really give this a try during the holiday. I know my guests will love this. They definitely will if they are chocolate fans! The festive colors of this are great for Memorial Day. I am a huge fan of pretzels so I am sure that I would love these. I will have to try them. I love the sweet and salty together! Oh yeah, keep some separate for the adults or you’ll be sorry lol. This is a fun recipe, looks tasty and easy to make! 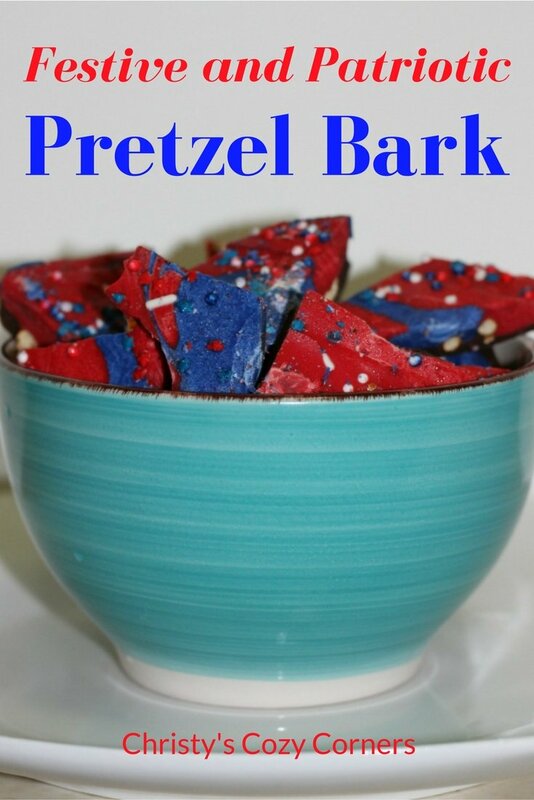 Love pretzels bark! I love all the ways you can make it! Cool idea! Looks patriotic enough to me! I am saving the recipe and I will tweak the colors depending on the occasion/holiday. 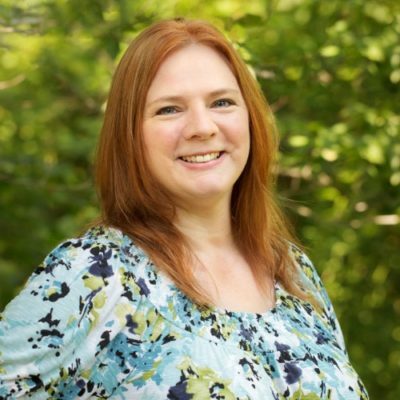 Red and Pink for Valentine’s, Green for St. Patrick’s day, Red and Green for Christmas, etc! It is so easy, so you’d be able to make it tons of ways! Wow! That is REALLY festive. What a great idea to celebrate… and I bet it’s also delicious. How cool is this!? Super festive and a great way to celebrate. Who doesn’t want something that LOOKS awesome and TASTES delicious? This is super easy and really festive. I love using chocolate melts, they bring food to life. I do too. They make everything better.